The first Monday in May is easily the Super Bowl of fashion. Especially when you have Tom Brady and Gisele Bundchen as stylish co-chairs. This year’s exhibit is Rei Kawakubo/Comme Des Garçons Art of the In-Between, honoring the artistry of Kawakubo. I’m really looking forward to checking out the exhibit later this month myself, but for now, on to the best and worst dressed attendees at the Met Gala 2017. The dress code for this year was to dress “avant garde” which is a bit of a tall order. Many celebrities completely missed the mark, and dressed in typical Oscar gowns you’d normally see in February. Of course, some celebrities brought their A-game. PS this roundup is Kardashian-free. Even though I love Kim’s simple white Vivienne Westwood dress, which is avant-garde for her. 6. Rihanna in Comme des Garçons. This look is polarizing, but to me, it’s perfect for the event, and more importantly, Rihanna. 5. Tracee Ellis Ross in Comme Des Garçons. This look is avant-garde, and by the same designer of the event. It’s elegant, cool, and isn’t overpowering. 4. Lily Collins wore a Cinderella gown, and incorporated Kawakubo’s signature short fringe bob, and a unique silhouette with the drop waist of the gown. 3. Aymeline Valade wore an incredible embellished cyan suit. It’s cool, and effortless. I would wear this in real life. 2. Cara Delevigne wore a chic Chanel suit, hot off the runway. I love the metallic embellishment, complete with the avant-garde silver head. This was avant-garde done right. 1. Zoë Kravitz killed it in this Oscar de La Renta gown. I love how it sits off the shoulder and mixes millenial pink with edgy black flowers and contrast lining underneath her cape. Best Suit goes to Rami Malek, who interpreted Kawakubo’s famous quote “Red is Black” perfectly. 5. Jaden Smith wore a drab black suit… with the avant-garde element being his own cut dreadlocks. I’m not getting it, but I assume that’s the point. 4. Priyanka Chopra in Ralph Lauren. No wonder Ralph Lauren is closing up shop on Fifth Avenue! If this trench train dress is any indication, the brand is outdated, confused about their core customer and awkward-fitting. 3. Lena Dunham wore a plaid ruffle gown by Elizabeth Kennedy. This is not avant-garde, nor flattering. And reminds me of what SJP wore a couple years ago. 2. My second worst look is a two-fer! 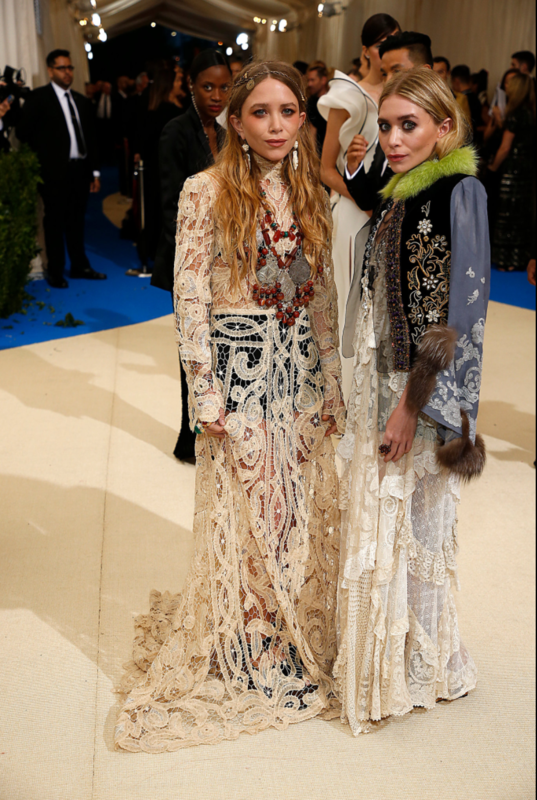 Mary-Kate and Ashley Olsen wore these hippie/vagabond/fortune-teller/lost Russian Princess Anastasia outfits that are both off-season and off-theme. I get that it’s an opportunity to plug their brand The Row (do people still buy The Row? Are they still making expensive crocodile backpacks? ), but fashion’s favourite set of twins really missed the mark with this narcissistic look. 1. 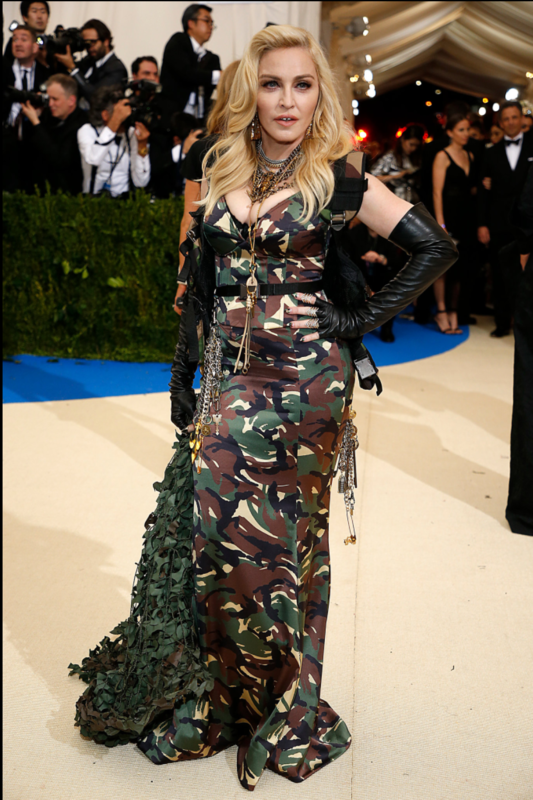 The worst dressed look goes to Madonna in this army camo Moschino get up. Nothing is avant-garde about this. Madonna has probably worn this look on tour, in a music video, or on stage at a Magic Mike Las Vegas show. WHERE WAS SARAH JESSICA PARKER!???!!! This question needs to be addressed. She hasn’t missed one since 2010, and this list misses her too. Of course Katy Perry’s get up needs to be discussed. To me, this is neither the best, nor the worst dressed. It encompasses the theme and pushes it to the edge. Finally, Katy Perry didn’t hold back. I actually really like the embroidered “Witness” on her veil… except what is she a witness too? A couple blah new singles? Taylor Swift’s demise? The red is on point for the theme, but is so attention-grabbing it runs completely contrary to Kawakubo’s reclusive life.